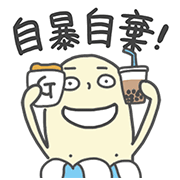 http://www.line-stickers.com/ – I Am Mr. Blue Banana 2 Line Sticker | Hello? Ahem, hi there. So Mr. Blue Banana’s back with a second sticker set! This time, he’s moved on from his depressive tendencies and graduated into a totally cute, totally chipper young man—with all-new animations and sound to show for it! So go in for that congratulatory hug and try out his new set today!